Portugal experienced its deadliest forest fire in its history. Paris saw floods caused by unprecedented rainfall. Germany also suffered record-breaking floods after what was described as the heaviest rainfall in a century. And this week residents living around Mount Vesuvius were evacuated after smoke from fires on the volcano’s slopes spread toxic fumes over a wide area. The human toll has been heavy with more than 60 dead in the fires in central Portugal alone. 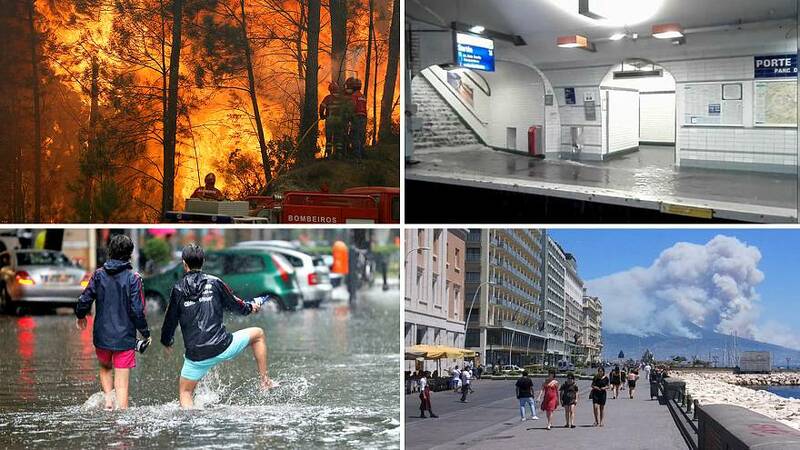 Extreme weather is becoming more common during Europe’s summers and meteorologists say the phenomena are likely linked to climate change. More than 2,000 people were evacuated in Spain to escape wildfires and heat wave plans were triggered in France, Switzerland and the Netherlands in June. Much of France had the hottest June night on record on June 21 and England had its hottest June day since a summer heatwave in 1976. Man-made climate change contributed to scorching heat across Western Europe this month, when Portugal suffered deadly forest fires and many nations sweltered under record-breaking temperatures, scientists said on Thursday. Monthly temperatures for June were set to be about 3 degrees Celsius (4.8 Fahrenheit) above long-term averages for Western Europe, the World Weather Attribution group of scientists said in a report. “We found clear and strong links between this month’s record warmth and human-caused climate change,” said Geert Jan van Oldenborgh, senior researcher at the Royal Netherlands Meteorological Institute, one of the authors. Climate change, stoked by man-made use of fossil fuels, had made the intensity and frequency of such heat at least four times more likely in France, Switzerland, the Netherlands and central England and made it 10 times as likely in Portugal and Spain, the study found, based on historical trends. The scientists said the heat was vanishingly unlikely to be a freak natural event, and could not be explained by shifts in the sun’s output or by other natural factors such as low amounts of sun-dimming volcanic dust in the atmosphere. That meant that a build-up of man-made greenhouse gas emissions, mainly from burning fossil fuels, had raised the risks. “By the end of the century, these high temperatures will become the norm in Western Europe,” they added.